We’d love your help. Let us know what’s wrong with this preview of Inferno by Joseph A. Springer. In a matter of seconds, the aircraft’s 250kg bomb would strike the Franklin, piercing the deck and setting off a chain reaction of exploding ordnance and aviation fuel. Afire, listing heavily to starboard, and with over 1,000 killed or wounded, it appeared as if the USS Franklin would find her end among the waters of the Pacific. The events that followed, however, would make the story of Big Ben one of the most dramatic and inspiring in naval history. 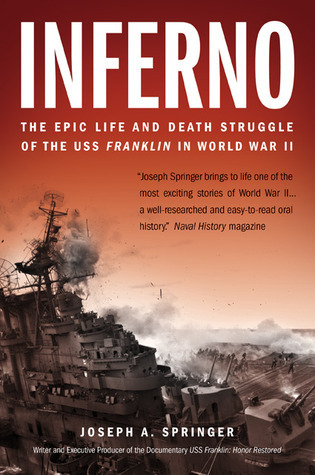 Now available in paperback from historian Joseph Springer, Inferno: The Epic Life and Death Struggle of the USS Franklin in World War II tells the heroic tale of the near-miraculous efforts that went into saving the USS Franklin—from the selfless contributions of the hundreds of officers and enlisted men who voluntarily remained onboard to the assistance of the USS Santa Fe in rescuing crewmen from the sea, fighting the fires, and closing in alongside the Franklin to take off the numerous wounded and nonessential personnel. Told in the survivors’ words, the story of the legendary ship’s arduous journey from Okinawa to the Brooklyn Navy Yard unfolds in harrowing detail. It is a tremendous tale of endurance and seamanship, and unlike any in the proud history of the U.S. Navy. Joseph A Springer's Inferno is an oral history of the USS Franklin. His focus is not on the events of March 19th, 1945 exclusively but rather the entire history of the ship. It has a nice pace and the interviews he selected complement each other nicely and reinforce that no two people see an event the same way. Springer takes on the controversy over Captain Leslie Gehres' decision not to call general quarters before the bombing. There was time and it is unclear why Ghres did not call general qua Joseph A Springer's Inferno is an oral history of the USS Franklin. His focus is not on the events of March 19th, 1945 exclusively but rather the entire history of the ship. It has a nice pace and the interviews he selected complement each other nicely and reinforce that no two people see an event the same way. Springer takes on the controversy over Captain Leslie Gehres' decision not to call general quarters before the bombing. There was time and it is unclear why Ghres did not call general quarters, many of the crew died while waiting for breakfast. What was refreshing was that Springer focused on crew members for his oral history whose stories may not have been known. If a reader were to read this book they would be best served by reading Father O'Callahan's I was the Chaplin on the Franklin then Hoehling's The Franklin Comes Home, then Jackson's Lucky Lady with Inferno being the last book. With these four books the reader would get a full picture of the events on the Franklin. Joseph A. Springer sets the standard for how oral histories should be written with "Inferno: The Epic Life and Death Struggle of the USS Franklin in World War II”. You feel as if you are on-board as the story of "Big Ben", the USS Franklin, in World War II unfolds. It is necessary read for anyone who claims to be a World War II history buff. The book divides into two parts. The ship's change of commanders is the dividing point - Captain Shoemaker's command and Captain Gehres' command. It is a wel Joseph A. Springer sets the standard for how oral histories should be written with "Inferno: The Epic Life and Death Struggle of the USS Franklin in World War II”. You feel as if you are on-board as the story of "Big Ben", the USS Franklin, in World War II unfolds. It is necessary read for anyone who claims to be a World War II history buff. The book divides into two parts. The ship's change of commanders is the dividing point - Captain Shoemaker's command and Captain Gehres' command. It is a well-structured book. It starts with the specs and construction of "Big Ben". It takes us through the training of the crew and shakedown voyages. We travel through the Panama Canal to San Diego and on to Pearl Harbor laying all the appropriate groundwork along the way. The author rapidly moves us into naval carrier operations. You are there in the South Pacific for many of the famous battles. You experience Iwo Jima, Peleliu, Luzon, Manila, Leyte, and Honshu. Mr. Springer takes great care in organizing and selecting interviews. You are in the aircraft cockpits experiencing the words and emotions of the men who lived through the survived the events. The stories are breath taking eyewitness accounts and survival stories. He manages to get you inside the heads of the pilots and ship's crew. You feel the fear and experience the heroism. The USS Franklin's size and importance led to one of the Navy's first encounters with Japan's Kamikaze attack planes. The suicide pilots delivered terrible damage to "Big Ben" in October 1944 off the Philippines. The damage forced Big Ben back to Bremerton, WA for repairs and a change of command. In March 1945, "Big Ben" experienced the devastating bomb attack off Honshu, Japan. That attack defined her crews' extraordinary valor. Somehow, they saved the ship. "Big Ben" traveled back to New York. She was rebuilt, but would never be the same. Mr. Springer makes good arguments to restore the entire crew of the USS Franklin's honor. You learn how the spiteful and hateful actions of her second captain attempted to segregate the crew into two groups. Group one was the sailors and airmen that remained on board during the entire ordeal. Group two was the person who did not stay onboard for the entire ordeal. Unfortunately, Captain Gehres made no differentiation for those who may have been blown overboard by exploding ordnance, forced off due to flames and heat, removed to a rescue vessel as a result of injury or simply because they were ordered to abandon ship. Joseph A. Springer wins the argument that All Hands of the USS Franklin were the real heroes of this gut-wrenching ordeal and fight for survival. This includes those on the rescue vessels. I must preface this by stating that I am not a history buff, and am not into military stuff. I do have a desire to read some history in the future, as I've learned that the history we were taught in public school is one-sided at best, and completely revisionist at its worst. Also, I'm not anti-military. I'm just anti-pointless wars. U.S. involvement in World War II was right, and so I'm more open to delving into the stories of that era. The reason I read this book is because my dad was born on t I must preface this by stating that I am not a history buff, and am not into military stuff. I do have a desire to read some history in the future, as I've learned that the history we were taught in public school is one-sided at best, and completely revisionist at its worst. Also, I'm not anti-military. I'm just anti-pointless wars. U.S. involvement in World War II was right, and so I'm more open to delving into the stories of that era. The reason I read this book is because my dad was born on the day of the disastrous events of March 19, 1945, so I found this book and got it for him. He then told me I should read it because, like me, even though it wasn't really his thing, he found it enthralling. I can't say enough good things about this book. The author was raised with a strong love for military history, and cares deeply about getting the story straight. This coupled with his writing style of narratives weaving together first-hand accounts from dozens of surviving soldiers makes for an absorbing fast paced read. These men are true heroes, full of courage and humility. I also have to add that the author, instead of aiming for sensationalism to draw the reader in, focused more on the story of the military men. These guys are on this boat for weeks and months at a time. Of course war is a terrible and heavy thing, but the soldiers need to stay focused on anything else to distract them from the terrible thoughts of what war is and their part in it. Thus, the author seems to have made a conscious choice to focus on these stories, without forcing the soldiers to recount things differently than they prefer to. This makes for a rather lighthearted read even though the subject matter is darkly intense. I believe this made for a more enjoyable read, and stayed true to the story of the soldiers, and what was going on in their lives and in their minds. I won this book through the Goodreads giveaways. This is a billiant book. I love the arrangement. It is well written and easy to read. The book covers every detail of the USS Benjamin Franklin aircraft carrier from the time it was built to the time it was dismantled. Interspersed with the telling of the overall story are the recollections of surviving crew who served on the ship. It gives a clear picture of daily ship life and the experiencs of the air squadrons. There are so many details of the m I won this book through the Goodreads giveaways. It gives a clear picture of daily ship life and the experiencs of the air squadrons. There are so many details of the minor and major hardships the common citizen does not think about being a part of military life. I was surrounded by Navy men growing up. I now wish I had asked them about their service in World War II. This book gave me a whole new appreciation for what our service people face and opened my eyes to some of the horrors of one of the worst battles of WWII. It also made me aware of the abuse we heap upon our own military. While this crew is the most decorated in Naval history, it was also vicim of one of the greatest injustices. Men who were trapped and escaped death or were blown off the ship by the concussion of the blasts that tore through it were labeled deserters, denied combat leave and recognition of their acts of heroism that saved other lives. It was truly a disgraceful end to an inspiring and heroic series of events. I read this book because my Uncle Pat died aboard this ship. I wanted to learn more about him. I now understand a lot more about WWII and its impact on the lives of my parents. I like the way the book is written, with a lot of background and interspersed with eye witness accounts of the tragedy. The worst tragedy of all is that the captain court martialled all who went overboard and the shame that brought on them for the rest of their lives. A massive fire on the flight deck caused by kamikaze attack spreads to other areas of the aircraft carrier USS Franklin. Springer brings to life this account of the third largest naval tragedy of WWII, behind the Arizona and Indianapolis. The format is unusual with insertions of personal accounts sprinkled through each section. It’s similar to Facebook posts with comments underneath. A well written, researched and interesting book about a part of the Second world War I knew little about. The author obviously spent a lot of time tracking down the people involved with the ship and his interviews were all of great interest to me. I learned something from this book and I enjoyed it from start to finish. Thanks for a "Goodread"
This is the latest in a series of books I've read about carriers in the Pacific. It's also one of the most amazing exhibitions of bravery and savage control ever seen. This book contains the story of a gentleman who is our family friend--naturally, it is on my read list.